The Elastos One Year Anniversary Event was a fantastic celebration for our community with twenty-one different countries represented at our three day event in Chiang Mai, Thailand. The highlights of Saturday’s conference included full reports on the progress of our first year and the announcement of our Alpha release, Cyber Republic launch, and the commencement of merge mining with Bitcoin via Bitmain, more than three months ahead of schedule. Elastos had a big anniversary. Let’s recap. Rong Chen gave a rousing speech about the history of Elastos and the lead up to our official launch in August 2017. He explained that after 17 years of working towards launching a network operating system for the world, Foxconn removed its investment into his project, and in the midst of that door closing, Feng Han appeared with a proposition, opening another door, the door to Elastos and with it the addition of blockchain to his decades long journey. Rong spoke of his determination to lead Elastos to success and demanded that the team hit their deadlines, releasing the genesis block on time and creating a culture of hitting all future deadlines. Based on Chrome and Elastos Runtime, provides reliable runtime environment for H5 DAPP. Carrier is embedded. iOS version is under implementation. Thorough test and maintenance approaches to ensure the smooth release of software and upgrade. Conducted security Audit and anti-attack test on Mainnet, Wallet and Chain browser. Merged mining was deployed with Bitmain mining pools starting with btc.com. This means that miners who join the mining pools for Bitcoin mining can also earn ELA as a reward because the miners can submit proof of work to both the Bitcoin and Elastos Blockchain simultaneously, with the same energy and hashpower. This merged mining can also be passed on from Bitcoin to the Elastos main chain to any number of Elastos sidechains to secure thousands of applications that might be connected to these sidechains. Elastos browser had its Alpha launch which integrates the Elastos Runtime and Elastos Carrier in it where http/https calls are disabled. This means that the applications developed for this browser are run inside the Elastos runtime environment while the communication is taken over by a decentralized peer to peer network called Elastos Carrier, while the IDs are authenticated using Blockchain. Each device, each url, each user, which is to say, everything gets an ID on the Elastos ecosystem. The browser supports an embedded wallet that contains support to hold the mainchain currency, ELA and the ID sidechain token. In the future, this same wallet can be extended to hold any number of Elastos sidechain native tokens. As part of the Elastos Smartweb Alpha, a number of demo apps were also released including wallet, instant messenger, blockchain based games and a CAR demo. In the future, the AuxPoW+DPoS consensus protocol will be implemented where the miners mine blocks via merged mining with BTC while DPoS nodes are used to sign blocks to create a finality on the blocks, thereby making it very difficult for a hard fork to happen. Some of the sidechains are also in active development, such as Ethereum smart contracts sidechain, NEO smart contracts sidechain, token sidechain and digital assets sidechain. The Elastos Smartweb Beta is scheduled to be released by the end of the year. Elastos Community Leader, Kevin Zhang, shared his experiences over the past 2 months, visiting 14 countries and attending 19 meetups organized by the Elastos community. According to Kevin, the most important factor to make Elastos successful is the amount of DApps running on top of Elastos. DApp developers will play a very important role in the ecosystem and his aim is to motivate them and encourage them to build on Elastos through Cyber Republic. Elastos PR Director, Hao Cheng, shared the PR dynamics of the year highlighting major events attended and awards received by Elastos. 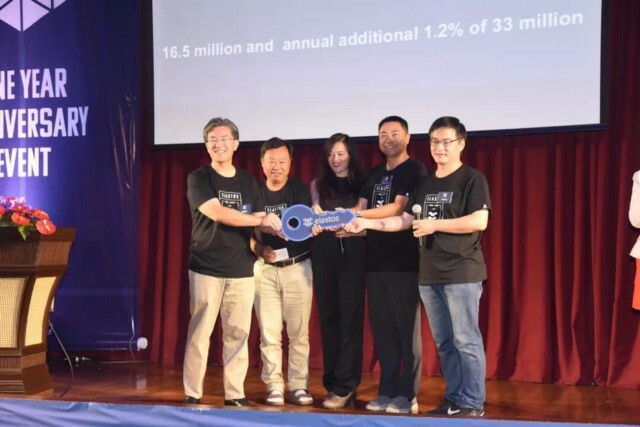 Feng also announced the beginning of merged mining with Bitcoin and his plans to set up a fund with Jihan Wu for the development of the Elastos Ecosystem. While Jihan Wu was not in attendance at the anniversary, he had this to say about the announcement of merged mining. Anniversary recap and AMA webinars were hosted by Elastos for the global community. The Elastos Team participated in several activities in Chiang Mai. Elastos community members organised a meetup in Bangkok. Feng Han attended the Blockchain World Forum hosted by the Blockchain World Forum Committee in Tokyo, Japan. He spoke about the value investment of blockchain and the core values of Elastos.